In The Elder Scrolls Online, all of Tamriel is open to you. Even the bit they called Elsweyr, that Bethesda have been avoiding for decades out of embarrassment. Oblivion’s green plane Cyrodiil is there too, of course, but you might have a harder time traversing it than some of the rockier parts around the coasts. The reason? 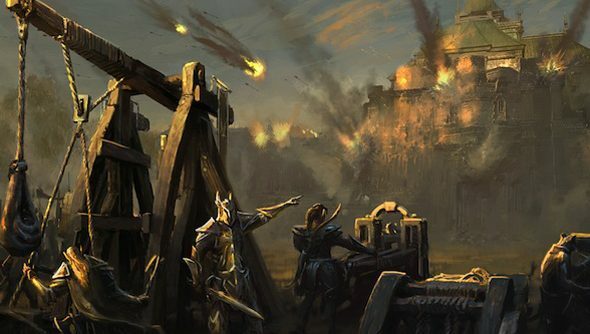 In ESO, Cyrodiil is a war zone – a no-man’s-land for the game’s undying PvP. Here’s how that’s going to work. In a recent Q&A on the official Elder Scrolls site, Zenimax Online were asked how they intend to ensure each PvP Alliance War campaign feels persistent. “Campaigns last for three months at a time, so you’ll find yourself running into familiar faces during them,” replied the developers. Players won’t be rotated out to another campaign unless they want to be – so they’ll be able to fight on the same front indefinitely. “You’ll be able to stay in the same campaign for the entire time your character exists if you want!,” write Zenimax. In the absence of permadeath and given the precedent set by EverQuest et al, that’s potentially a very long time indeed. And there’s a reason you’ll want to keep fighting – when a campaign ends, only its leaderboards and the overall faction scores are reset. The ownership of prized Scrolls, the capturing of Keeps, which player is Emperor – all of that information will be retained. “It gives a great sense of persistence when only the scoring mechanics reset,” promise the dev team. That persistence will also allow player-made groups to build up a physical presence to match their reputation. Guilds that take over keeps will be able to set up stores there, and visiting players of the same alliance can trade. It’s not quite Planetside, but it’s certainly a stark contrast to the fleeting nature of success in your average MMO. In The Old Republic, you’re lucky to have left the immediate area before the enemies you’ve just slaughtered are propped back up again. Do you think you’ll partake in ESO’s PvP? Or will you stick to sniping cliff racers in the wild?